DOWNLOAD Adorno, Theodor W. (1977/1962). Commitment. In Aesthetics and Politics, Theodor Adorno, Walter Benjamin, Ernst Bloch, Bertolt Brecht, Georg Lukacs. London: Verso, pp. 177-195. 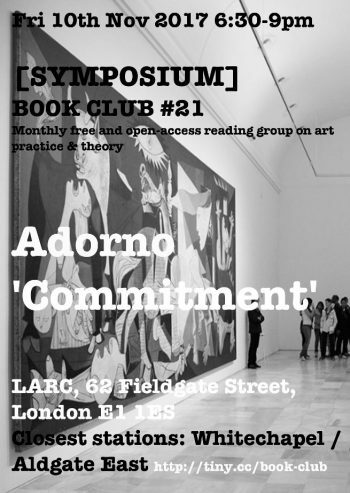 [SYMPOSIUM] #21 Adorno: Commitment. Flyer by Nat Pimlott. In ‘Commitment’ Theodor Adorno explores the possibility of political content in art through a consideration of the idea of ‘commitment’ on the part of authors, as put forward by Sartre in an essay on literature, and the political intent in the work of Bertolt Brecht. Adorno explores problems he identifies with art that is concerned with making political messages and instead makes a defence of ‘autonomous’ art – claiming that the autonomy of art acts as a form of resistance to society in and of itself. This text poses central questions in respect to the value of art in contemporary society and the role artists can hope to have in relation to political and social discourse, questions which seem pressing at this time when societal norms about the values and the stability of the liberal cultural consensus appear to be less stable than thought following the election of Donald Trump and Britain’s vote for Brexit. In what way can a work of art be considered autonomous? How is an autonomous work of art identifiable? What relationship does the market have to the autonomy of art? Does autonomous art still exist? What does Adorno mean when he speaks about the ‘life of the mind’? Does it matter what the audience for art is? Is art just preaching to the converted? How can an autonomous work of art affect society? What role does political awareness have in the making of art? Can successful art have a political message? Is it possible to make good art with bad politics? What is the duty of an artist in times of political crisis? Are an artist’s motivations relevant to the finished work? What relevance and role can art have for society today? Has this changed since Adorno wrote this article? Sartre, Jean-Paul (1948). What is Literature? Trans. Bernard Frechtman. New York: Philosophical Library. Brecht, Bertolt (1983/1935). On non-objective painting. In Modern Art and Modernism, Francis Frascina and Charles Harrison eds. New York: Harper & Row, pp. 143-144. Amy Sillman (2017). Unpresidented times. Artforum, 5 Jan 2017.